In a medium-sized pot, mix together the rice, coconut milk, garlic, salt, and water. Cover and bring to a boil. Once the pot reaches a rolling boil, reduce heat to low and let simmer for 30 minutes. After 30 minutes, turn off heat and let sit (with lid on) for an additional 10 minutes. Fluff the rice and combine it with the chopped vegetables and cashews (I reserve a few whole cashews to garnish with, but it's not necessary). 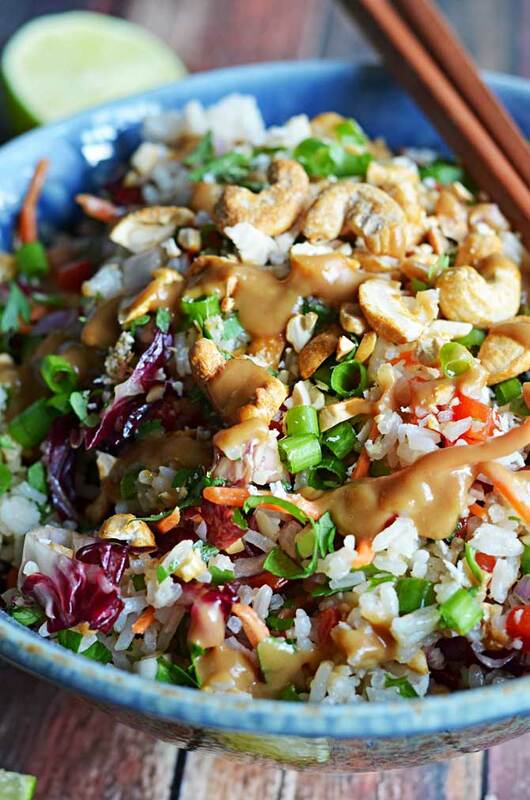 Drizzle with a bit of the Ginger Peanut Sauce and taste-- you most likely will not need to use all of it. Serve with lime wedges.